McKinney is all about being health-conscious these days, one of the many things that makes our “unique by nature” brand so appropriate. Yes, we have many beautiful parks, nature trails, biking paths, disc golf courses and athletic fields and gyms galore, but these amenities are not what make McKinney unique. Below are three reasons McKinney is setting the pace for healthy living in North Texas. REASON 1: McKinney’s mayor is an avid healthy living and fitness enthusiast who is challenging the entire community to change eating and fitness habits by working together to all focus more on living the healthiest lives we can. 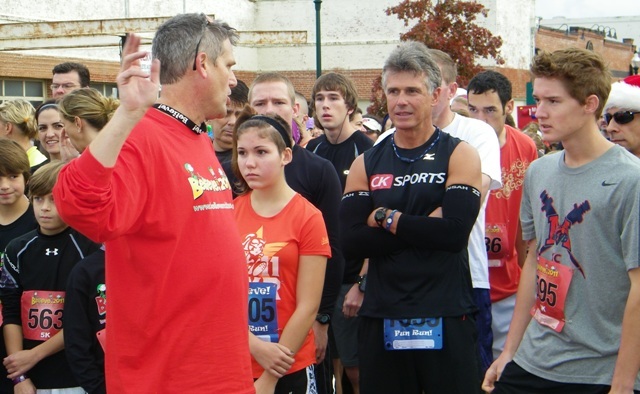 Mayor Brian Loughmiller (front, in black) at the start of McKinney's Believe Run in November 2011. Loughmiller doesn’t just talk the talk. He walks the walk, and runs and cycles and swims and anything else he can do to keep himself healthy…to lead by example. Residents and visitors who participate in 5Ks, 10Ks and even triathlons here in McKinney and elsewhere will often see Loughmiller among the racers at the starting line. Last year alone, he competed in the Believe Run and other local running races, the Historic McKinney Kiwanis Triathlon, cycled in the high-speed Bike the Bricks race then turned around and participated in the Hotter’N Hell 100 Mile Endurance Race (in Wichita Falls last August! ), and even completed an Iron Man competition in the fall. And he wants McKinney residents to do what they can to live a healthier life. “For the next 100 days, employees of the city of McKinney and the McKinney School District will be participating in a Live Healthy North Texas Challenge,” Loughmiller said. City employees began their fourth year in this program this week, and now our mayor has opened this program up to the entire community. For more about joining the Live Healthy Challenge program, click HERE. 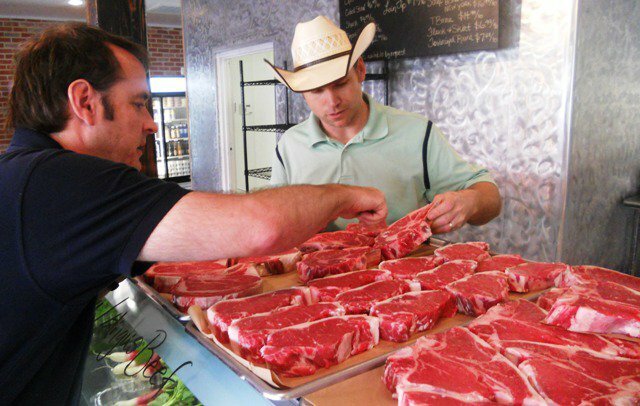 Owner Matt Hamilton (in hat) helps a customer pick out steaks at Local Yocal. Roam around our historic district and you’ll find all sorts of businesses and eateries where you can buy locally-grown food. Fresh produce, cheeses, herbs, baked goods and meats are all available at the Chestnut Square Farmers Market. Shoppers can also find fresh or prepared (ready-to-eat) grass-fed and free range meats, farm-fresh eggs, locally made grains and dairy and such at businesses like Local Yocal (pictured at right), The Pantry, Square Burger, Patina Green, and others. This type of food is considered “slow food,” as explained in this video produced by the city’s communications department. Those interested in more “green living” have opportunities several times a year to take part in classes offered by the city’s Office of Environmental Stewardship. Recently, this office hosted a “make your own rain barrel” class for harvesting of rainwater residents could use for watering their lawns and flowerbeds. Residents also have opportunities through this office to learn more about recycling efforts (this includes fun, interactive children’s programs as well) and to take part in community clean-up programs. Keep up with the latest from this department by checking their website frequently. REASON 3: McKinney is poised to become a “hub” of knowledge for helping those dealing with perhaps the scariest of health concerns – cancer. Monika Norman, owner of Spa Esoteric, in one of the spa's treatment rooms. Despite efforts to live the healthiest life possible, a percentage of people will develop cancer. In fact, most of us have been touched by cancer in some way. One such person is Monika Norman, owner of downtown McKinney’s Spa Esoteric. The passion she has for her profession and the fact loved ones and clients of hers have dealt with the disease sparked her drive to educate people about physical changes brought on by the disease and medical treatments, and how to safely treat oncology clients in a spa environment. Chemotherapy and radiation change the skin on all layers, making it react differently than “normal” skin to the products that spas use. Likewise, there are massage techniques (such as deep tissue massage) and skin care treatments that some cancer patients should not undergo because a client’s post-surgical body or one affected by chemo simply can’t handle the treatment. In fact, Monika and her staff have a questionnaire they go through each time an oncology client visits that assures they are able to assess (or re-assess) the client’s current situation. Also, certain aspects of the spa and its equipment come into play when dealing with patients who have compromised immune systems. “You have to have a proper protocol for dealing with these special needs clients, and I want to help develop that on a national level,” Norman said. To this end, Monika performed exhaustive research as well as calling on her background as a medical aesthetician to create a “safe spa” environment here in McKinney. She has surrounded herself with people, including her like-minded staff, who share her philosophy and her passion for helping sooth those fighting cancer. This past weekend, visiting instructor Toni Muirhead worked with a dozen massage therapists from Monika’s staff, That Elegant Touch (McKinney) and Rough Creek Lodge (Granbury). Future classes will also take place in the coming months as Monika brings in a certified aesthetician (in March) to teach about skincare for oncology clients, and then Muirhead returns (in April) to work with more massage therapists. I like all the smiling people in the pictures. It must be the McKinney water that makes them so happy.